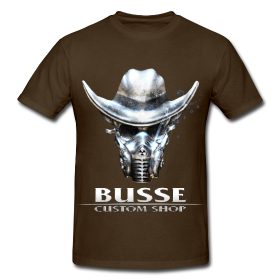 As many of you know, Busse Custom Shop t-shirts are very hard to come by. We offer limited numbers at larger shows across the country, and unfortunately we always sell out immediately. But now we are proud to announce that we will be offering Busse Knife Group clothing and some accessories with the Busse Knife Group, Busse Combat, Swamp Rat, Scrap Yard, and Custom Shop logos. You will find many of the designs you love by our own Rob Stanley. So take a look around our BUSSE KNIFE GROUP MERCHANDISE store and buy a shirt or two to show your love of all things Busse.